Enjoy a spectacular view of the Red Sea from a furnished balcony or terrace. Southern Mediterranean decor complements a spacious 38-sq.-metre room featuring one king or two twin beds offering the softest Egyptian cotton linens, generous work area with high-speed Internet access, and marble bath with soaking tub, walk-in shower and deluxe bath amenities enriched with Dead Sea minerals. Spectacular Red Sea views from a furnished private balcony welcome you to a 38-sq.-metre room offering elegant Mediterranean-inspired decor. Pampering amenities include king-size bed with the softest Egyptian cotton linens, generous work area with high-speed Internet access, and spacious marble bath featuring soaking tub, walk-in shower and deluxe bath amenities enriched with Dead Sea minerals. Premier views of the Red Sea from a furnished private balcony welcome you to a 38-sq.-metre room offering elegant Mediterranean-inspired decor. Pampering amenities include king-size bed with the softest Egyptian cotton linens, generous work area with high-speed Internet access, and spacious marble bath featuring soaking tub, walk-in shower and deluxe bath amenities enriched with Dead Sea minerals. Stunning sea views from a private balcony welcome you to a 38-sq.-metre room offering Mediterranean decor and rich amenities, including king-size bed, high-speed Internet and marble bath with soaking tub, walk-in shower and deluxe bath amenities. Includes access to a Club House offering secluded beach, gardens, a private swimming pool and whirl pool. The private Club lounge serves Continental breakfast, evening cocktails and hors d'oeuvres. Experience the luxury of an 85-sq.-metre villa suite offering stunning views of the Red Sea from three furnished balconies. Mediterranean decor features large living/dining areas, deluxe marble bath, king bedroom and work area offering high-speed Internet. Includes access to a Club House offering secluded beach, gardens, a private swimming pool and whirl pool. The private Club lounge serves Continental breakfast, evening cocktails and hors d'oeuvres. Experience the luxury of an 80-sq.-metre villa suite offering stunning views of the Red Sea from two furnished balconies. Mediterranean-inspired decor features a large living area, two baths, king bedroom and work area with high-speed Internet. Includes access to a Club House offering secluded beach, gardens, a private swimming pool and whirl pool. The private Club lounge serves Continental breakfast, evening cocktails and hors d'oeuvres. Experience the luxury of a 124 -sq.-metre villa suite offering stunning views of the Red Sea from a 26 sq. metre terrace. Mediterranean-inspired decor features a large living area, two baths, king bedroom and work area with high-speed Internet. Includes access to a Club House offering secluded beach, gardens, a private swimming pool and whirl pool. The private Club lounge serves Continental breakfast, evening cocktails and hors d'oeuvres. Experience the luxury of a 164 square metres suite offering stunning views of the Red sea from a 26 square metres terrace. Mediterranean inspired décor features a large living area, three bathrooms, a kitchenette, two bedrooms and a work area with high speed internet access. Includes access to a Club House offering secluded beach, gardens, a private swimming pool and whirl pool. The private Club lounge serves Continental breakfast, evening cocktails and hors d'oeuvres. A spectacular beachfront setting on the Red Sea welcomes you to a 307 square metre, two level retreat featuring a ground level that opens onto a 114 square metre private verandah. Lavish decoration includes an outdoor dining area on the verandah, guest living room, dining room, writing desk and guest toilet, fully equipped kitchen with service door and twin guest room and bathroom, with shower and bath. Upstairs features include a master bedroom covering 54 square metres with a king-size bed, living room with writing desk, master bathroom with step-in Jacuzzi, two vanity tables and walk-in wardrobe, guest bedroom of 47 square metres and bathroom and toilet. Guests can enjoy all Regency Club privileges including usage of private beach, swimming pool, whirl pool and lounge. In addition to a private chef for serving breakfast at the villa and a dedicated butler. Guests are offered free limousine transfers from and to the airport. The restaurant is classically Thai with rich teak wood, sensuous fabrics, antique art and an open display kitchen. The Sala Thai Restaurant in Sharm El Sheikh offers an evening of grace, refinement and congeniality with a genteel and charming atmosphere. Hyatt Regency Sharm El Sheik´s restaurant Café Fresco offers a variety of Mediterranean specialities, predominantly traditional hot and cold buffet dishes that are constantly updated or given a flavourful twist. The choice of food is seasonal, aromatic and always fresh. Guests can watch their food being cooked at the open charcoal oven and live cooking station. Located on the edge of the river pool and waterfalls, Cascades restaurant offers delicious grill dishes, light salads and home-made ice cream. Dinner in Sharm El Sheikh is for romance, elegance & tranquillity; treat your palate & soothe your soul. Enjoy fine wines and succulent grills amidst the reflections and sounds of the waterfalls. Cascades menu features our all new stone cooking. Poised on the edge of the breathtaking Red Sea whether savouring the freshest seafood grilled to perfection or just a light and tasty salad with a cool cocktail, the Beach House is the perfect place to unwind. Dinner at the Beach House is a serene experience of exquisite seafood and casual fine-dining looking out at the shimmering sea lapping against the shore. The Courtyard measures 24 x 24 metres (576 square metres). This open-air venue features direct access to the Conference Centre and is reminiscent of an Andalusian courtyard. A large fountain and Egyptian obelisk decorate the central area and add interest. The Terrace measures 20 x 10 metres (200 square metres) and is an open-air venue that leads out onto a verdant lawn and lush gardens. The Pre-Function area measures 16 x 7 metres (112 square metres) with a ceiling height of 3 metres. The Grand Ballroom divides into three rooms and measures 38 x 18 metres (684 square metres) with a ceiling height of 6 metres. It can accommodate up to 550 guests in a banquet setting, 800 guests in a cocktail setting and 700 theatre style. The venue features a built-in stage with theatrical lighting, sky hooks, drop-down screens and digital projection units, data links, phone lines and round-the-clock audio-visual support. The Regency Room divides into three rooms and measures 23 x 11 metres (253 square metres) with a ceiling height of 4.5 metres. It can accommodate up to 170 guests in a banquet setting, 240 in a cocktail setting and 234 theatre style. The Bay Room divides into two rooms and measures 12 x 9 metres (108 square metres) with a ceiling height of 3 metres. It can accommodate up to 60 guests in a banquet setting, 80 guests in a cocktail setting and 70 theatre style. The Boardroom measures 11 x 6.metres (66 square metres) with a ceiling height of 3 metres. It can accommodate up to 18 guests in a banquet setting. 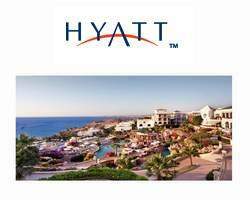 Hyatt Regency Sharm El Sheikh Resort has a wide selection of activities to fully enjoy your holidays in Sharm El Sheikh. Among others, the hotel offers water sports on the Red Sea, Eco- tourist trips and an 18-hole golf course. Within the hotel, the Water Sports Center, Club Olympus, Oasis Kids' Club and The Souk ensure non-stop activity for our holiday guests. A balanced, enjoyable and successful life requires harmony between mind, body and spirit. If any one of these elements suffers an imbalance, disharmony is evident. The main aim of spas is to ensure that you feel more relaxed, physically and emotionally. The spa is divided into two separate areas for males and females. It provides heat treatments such as sauna, steam room, jacuzzi and plunge pool. This dry heat treatment is very relaxing and comforting if you have any sort of tension. At temperatures averaging 90°C, you can sit in a heated room that has little humidity. It is the relaxation treatment for those who cannot tolerate moist heat. A deep bathtub with underwater jets that therapeutically massage the feet and back. Water is heated to approximately 40°C. You can sit in a room filled with moist heat at 45°C and 100% humidity. This treatment cleanses the pores and rids the skin of embedded dirt. It helps restore a healthy glow to sallow complexions. It warms and soothes aching muscles, joints and tendons as well as lubricating the upper respiratory tract. There is a passionate commitment to water throughout the resort. The centrepiece of the resort is the three-pool complex covering 2500 square metres. A dramatic seven-metre-high water cascade flows over a rocky slope out of the central building, cascading down over a cave grotto into a warm, winding river replete with lifelike currents. A round party pool is nested into the top area and is surrounded by whimsical jet sprays from both top and sides. From the upper pool to the middle pool there is a five-metre drop, which creates a dramatic grade change with waterfalls and a gorge water cascade at the base of the wooden sun deck. The adjacent shallow pool 'sun shelf' provides a 'walk-on-water' illusion. Matching spa pavilions frame the middle area, while an outrageous 80-metre corkscrew water slide is integrated into the slope's natural twists and curves, exiting into the middle pool. Bridge crossovers allow land-bound guests to view thrilled guests on the water slide. The lower pool is the largest body of water and has an expansive sun deck area with unobstructed views of the sea. Shallow pools and sun-lounging terraces allow guests to sit in the water or along the broad steps and soak up the sunshine. Underneath the pool area, a virtual catacomb, replete with numerous levels of stairs and galleries, houses the 96 pumps needed to run the pools. Accessed through doors carved into the rock, this underground station looks like something right out of Dr No. The area is covered in 4500 square metres of tiles and is interlinked with 250 metres of tunnels and caves that allow for back-of-the-house motorised transport. An 18-hole golf course is located in the city of Sharm El Sheikh.